The common land birds are all familiar British species. The sea birds are more interesting. They fall into five main groups :- cormorants, gulls, auks, petrels and waders. Gannets are to be seen cruising above the water and diving spectacularly from a considerable height. Various gulls can be found -great black-backed, lesser black-backed, black headed, herring, kittiwake common tern and roseate tern. Take care if you are eating in the open around St Ives as you are liable to lose your lunch to a swooping gull. 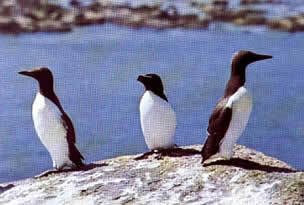 The most abundant breeding auks are the guillimot and razorbill. 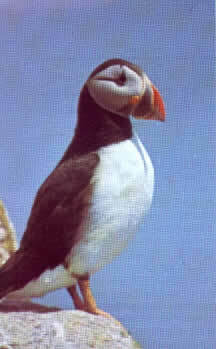 Puffins are rarely seen on the mainland but some breed on the Scillies. The Manx shearwater breeds on Scilly too as does the fulmar petrel. Of the waders you may find the ringed plover, turnstone, snipe, sandpiper, curlew and oystercatcher in and around the estuaries. Cornwall is renowned as a haven for migratory birds and birds of passage. Each spring and autumn bird watchers descend on the County in ever increasing numbers when a rare species is spotted. In May 2002 a rare sighting on Scilly of a lesser kestrel brought over 2000 twitchers to the islands.